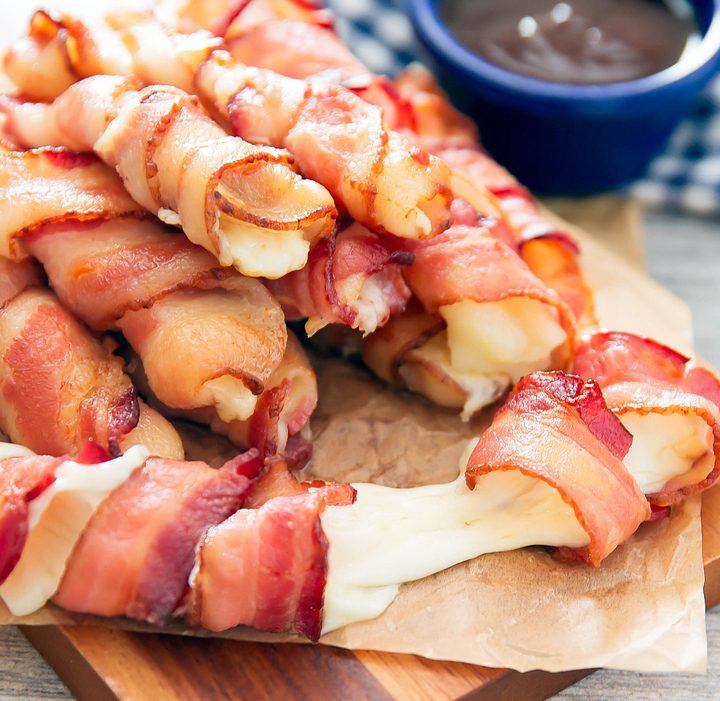 Bacon wrapped cheese sticks. You can imagine the rest right? 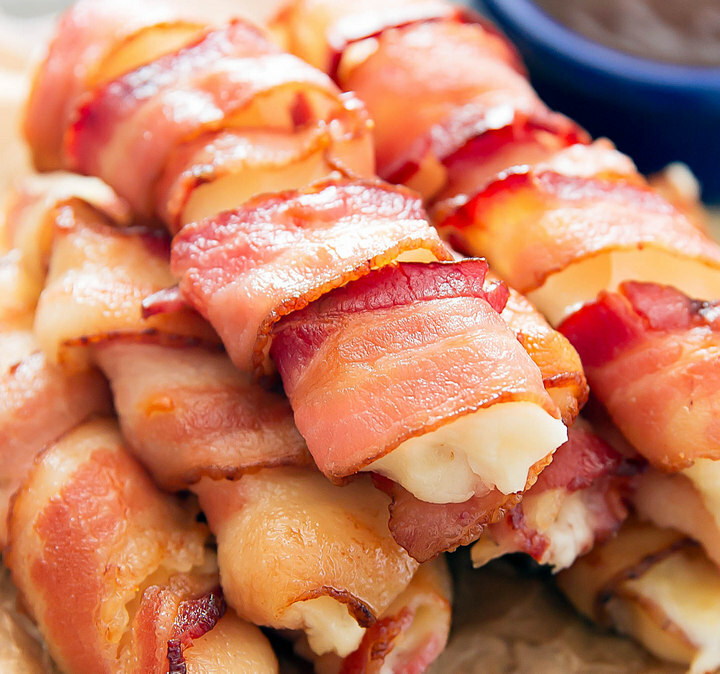 Gooey, stretchy, melted cheese, just covered in bacon! With the Super Bowl coming up, my mind has turned to fun appetizers to make for game day. Of course, one of them has to involve bacon. Over the years, I’ve made bacon wrapped avocado fries, sriracha bacon wrapped onion rings, and bacon wrapped eggplant fries. These smelled so good coming out of the oven. 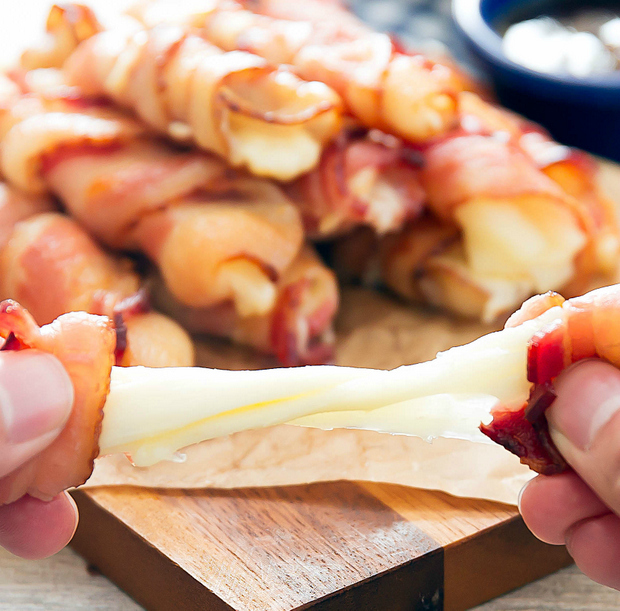 Because the cheese melts, the bacon wrapping will also loosen when these are finished. It’s not quite as sturdy as my previous bacon wrapped recipes, but it’s still delicious. And you can break them, stretch them, dip them in bbq sauce, etc. To get these to work without making a huge cheese puddle mess, I used packaged precooked bacon. You can’t get as tight of a wrapping as when the bacon is raw, but the packaged precooked bacon usually is flexible enough that you can still wrap it around the cheese. I used 2-3 strips of bacon for each string cheese stick. Then you bake until the bacon is crispy, about 6-10 minutes. By this point the cheese should be melted, but still somewhat hold its stick form. While making these, I was thinking of another way to accomplish this. Next time, I might try freezing my cheese sticks first and then see if I can wrap it in raw bacon and cook it. I’m worried that the cook time baking would still be too long because it does take a while for bacon to crisp up in the oven. 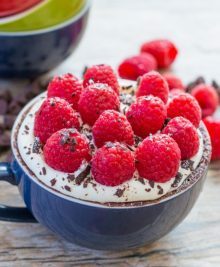 As I was writing up this post, I did find another recipe out there that does freeze the cheese and then deep fries the bacon. That seems like a solution though I’m not a big fan of frying bacon because of all that splattering. I’ll have to experiment some more when I restock on bacon and cheese. 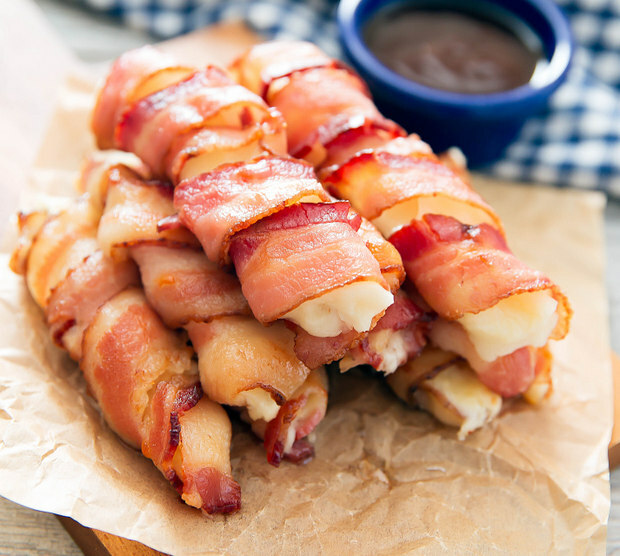 Mozzarella cheese sticks wrapped in crispy bacon are a fun and addictive snack for game-day! 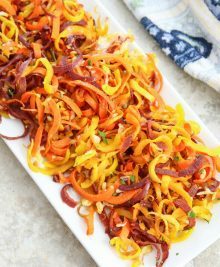 You will need to use pre-cooked bacon for this recipe so look for packages of it at the grocery store. Those look crazy!!! I wonder if you froze the cheese, AND slightly precooked the bacon so it has a head start, maybe that would work? 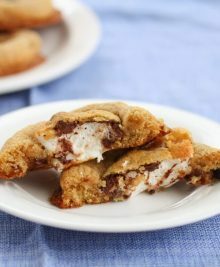 I am going to try these. Might have to practice a few times before game day, darn!! I think that actually is a great idea and is actually what I was thinking of doing next. I think if the cheese is frozen and you cook raw bacon just to the point where it’s light pink but still bendable, it should work, though it’ll be a little messy for your hands! ne a baking sheet with foil; place a cooling rack on top and then lay your bacon strips on top of the cg rack and precook for a short period of time.